Firs I have to say that the schematic doesn’t include power supply source. The power supply will be made of toroidal mains transformer and bridge rectifier with Schottky diodes. As one can see the schematic is fully symmetrical. The PCB also keeps that symmetry as much as possible, but let me explain a little more about the schematic. The power supply voltage is being filtered by four capacitors at each channel – the electrolytic C1, C2 and C3, C4 and the non-polar C5, C6 and C7, C8. 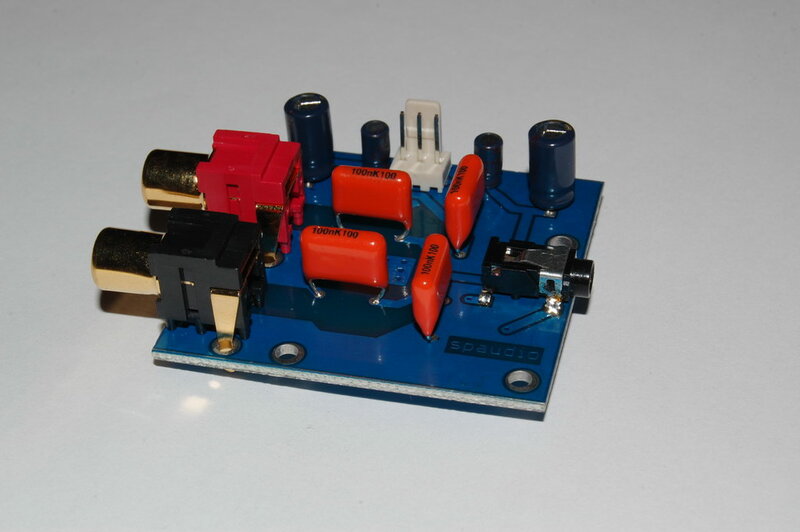 Speaking about HiFi amplifier it must use only high quality components. The electrolytic capacitors are from Panasonic’s FC series, and the non-polar ones are high quality polypropylene ones made again by Panasonic (made in Japan). The delivery of all these exotic (at least for Bulgaria) and high quality capacitors took almost a month but it definitely worth it. 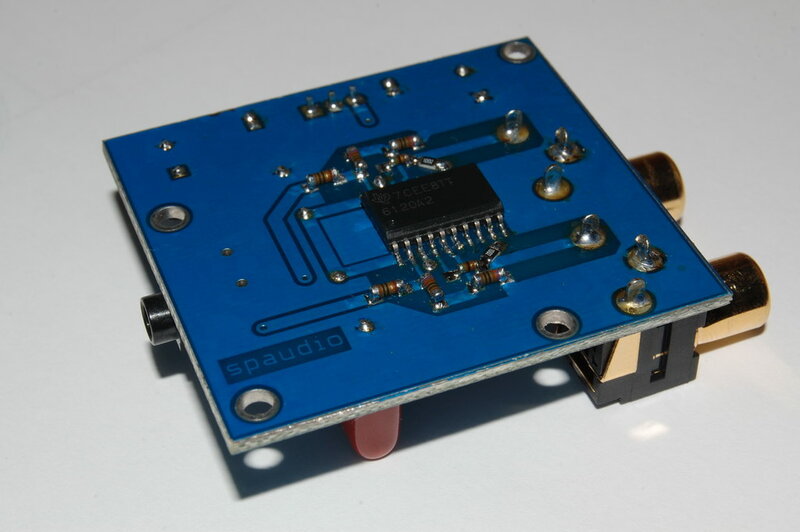 The topology used is non inverting with 2V/V amplification. That of course led to high continuous voltage at the output (DC offset), which almost trashed a pair of headphones. 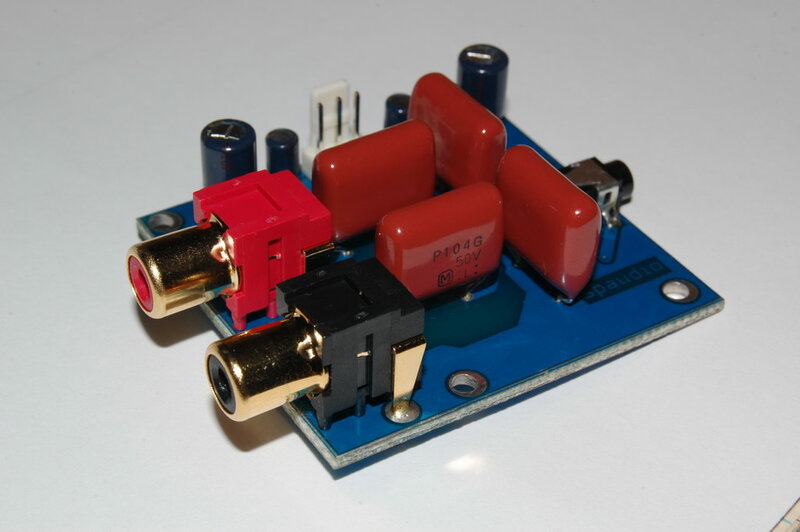 The problem was solved by placing R9 and R10 into the circuit which reduced the offset to acceptable value so the amplifier is no more dangerous for any headphones. Also the offset is low enough not to influence the audio quality. 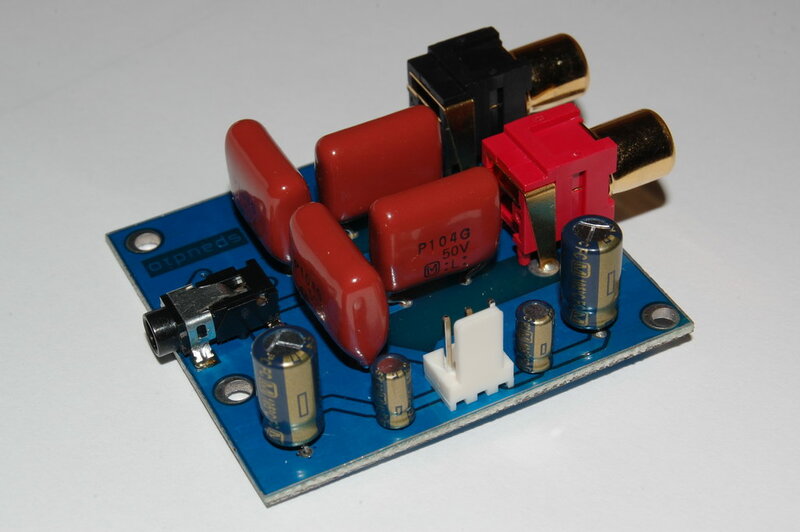 There are two input and two output resistors whose purpose is to protect the amplifier from self excitation caused by parasitic capacitances, output capacitance of the audio source and capacitance of the phones cable. The values of these resistors are recommended in the device’s datasheet. All resistors except the ones in the feedback path (R3-R6) have tolerance of 1% (marked as professional in their datasheet). The feedback resistors are chosen to have tolerance of 0,1% (these are marked as precision) to guarantee maximum symmetry of the two channels. Are resistors are MELF type (Metal Electrode Leadless Face) and they are made by Vishay. The signal connectors as well as the output connector are of good quality so they match the other components well. 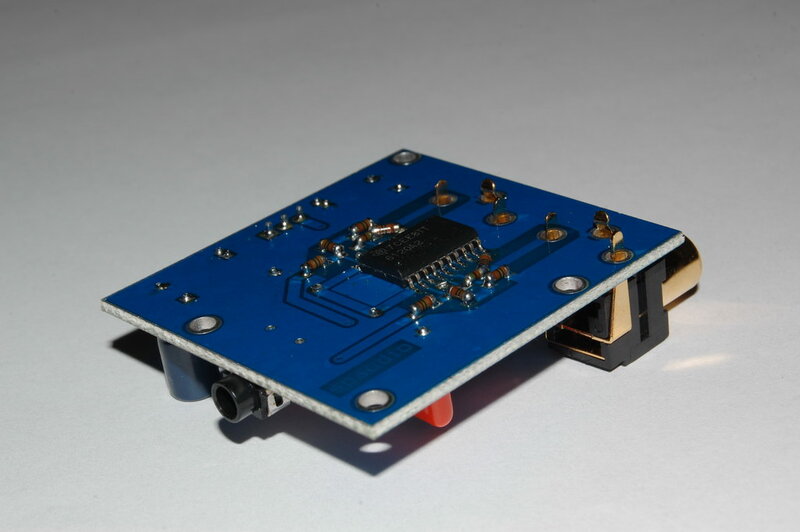 The PCB which can be seen on the photos at the bottom is specially designed for this project. All requirements from the amplifier’s datasheet are kept, like minimal distances between the components and minimal length of the input and output traces. The PCB is designed to as much symmetrical as possible so it matches the schematic very well and this guarantees equal signal path for both channels. Another requirement is also kept, specifying the ground plane area which should not be close to the input path so parasitic capacitances will be avoided. Specially designed metalized openings help for maximizing the heat dissipation of the IC, which has ThermalPad on its bottom side. The long waiting of components, the long PCB design time and its optimization for symmetry and minimum signal path took effect. I believe that the designed amplifier can be pronounced audiophile and even if it isn’t, it is way better than every headphone amplifier found in all mass audio systems. Of course such an amplifier requires high quality audio source and high quality headphones in order to reproduce good sound. You can have a look at the finished amplifier on the photos below. The first three photos are of the components mentioned above, and the second three are of another version with polyester capacitors made again by Vishay and resistor in the feedback with 1% tolerance. That doesn’t mean low quality but lower price instead. Hearing the difference is very hard for inexperienced listener. On the third photo one can see general purpose 1% 0806 resistors in parallel to the input instead f the Vishay ones because the photo was taken while waiting for these to arrive. 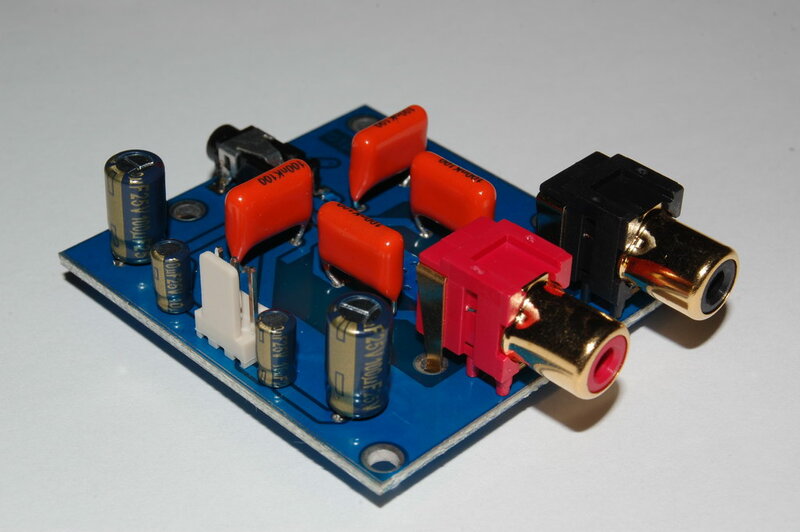 Posted on 02.03.2010 01.06.2017 by PenoffPosted in Headphone amplifier with TPA6120A, ProjectsTagged amplifier, audio, current, headphone, HiFi, phones, TPA6120.